At get2gether, we believe that everyone has the right to love and friendship. We also believe that people meeting each other should be easy, fun and accessible. We publish a monthly newsletter which lets our members know all about our events. From karaoke to book groups, from dinner to life drawing, and everything in between!. 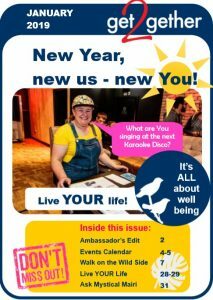 January 2019 Newsletter (it’s a big download – it might take a minute or two!). get2gether was created to respond to the social isolation regularly reported and experienced by people with disabilities who wanted opportunities to find friendship and love in adult relationships. get2gether is a Scottish Incorporated Organisation (SCIO) charity which offers social and friendship opportunities to adults with disabilities in Edinburgh and the Lothians. You can find out more about us in our most recent annual report on the OSCR website. get2gether has been operational since 2013 and we now have over 700 members. Garvald Edinburgh, Freespace, Elcap and Thistle Foundation are our four founding organisations. We have also had support from The Big Lottery, The Scottish Government, and The Bank of Scotland Foundation. We are grateful to everyone who has supported us.